I've always considered Ruth Rendell to be the undisputed queen of the disturbing psychological thriller, so I was chuffed when I found this relatively recent Rendell novel at the library. Rendell's impressive series of Inspector Wexford novels are also highly readable, but it is in the non-Wexfordian books that her unsettling prose truly shines. But not, sadly, in this book. In fact the most unsettling thing about Portobello is that it all seems rather pointless, petty almost. This may be somewhat intentional on Rendell's part, to reflect the silliness of the addiction to a particular brand of sugar-free candy that the primary character, Eugene, finds himself spiraling into. I found it difficult to believe that anyone, even a man as secretive and set in his ways as Eugene, would allow a candy to destroy the most important relationship in his life. There are a series of coincidences that lead to the unfolding of events in Portobello: Eugene's decision to tape a note to a post about a sum of money he found, rather than keep the money or take it to the authorities, and then to ask Lance to come to his home to make his claim instead of just asking him over the phone how much money he had lost. This allows Lance, a petty criminal, to case Eugene's neighbourhood. That Eugene's girl friend, Ella, happens to be a physician who returns the money to its rightful owner, Joel, who happens to be in hospital and who then happens to become her private patient, is the next in the series of happenstance. And it continues on and on. Portobello is actually an enjoyable read, and despite the unclear motivation behind many of the characters' actions, the characters are memorable in their own way. The deeply disturbed Joel is the most Rendellesque character and the one who offers the best promise for delicious creepiness, particularly after he becomes haunted by the specter of Mithras, the angel whom he inadvertently brought back with him from the brink of death. But ultimately, the finale feels soft and unworthy of a Rendell novel. 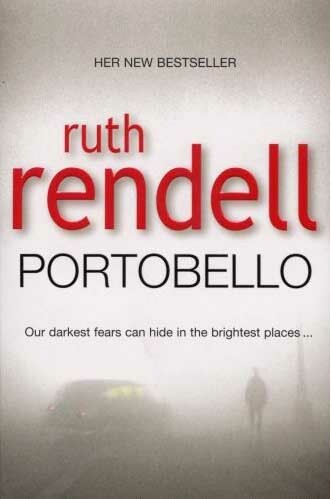 Portobello is certainly not Ruth Rendell's most successful effort, but it does pass the time quickly on a snowy weekend. It's surprisingly less trippy than one would expect, given those factors, SME. Rather pedestrian, in fact. The plot sounds like fun. Sorry it wasn't as delicious as one might expect. Once in a while, I like reading a mystery, but I'm not a fan of this author. Wait, is this book about mushrooms? Because I hate mushrooms. Fortunately she has a couple of other new books that I haven't yet read, John. I think she may have phoned this one in to concentrate on the others. She's one of my favourites, Mr Anchovy. What mystery writers do you generally read? I didn't notice any mushrooms, Beckeye, although that might have helped. End in Tears was a total bust for me. I've never heard of this author. Guess I should start on her other books then? I didn't mind End in Tears, Leazwell, but it certainly wasn't one of my favourites. Her catalogue goes back decades, Al, you have loads to choose from.